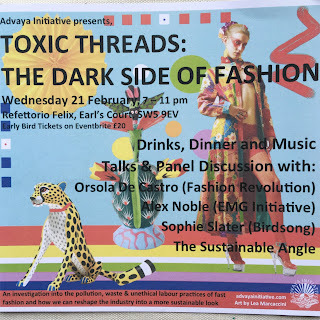 On Wednesday 21st February I went to an event organised by The Advaya Initiative: Toxic Threads: The Dark Side of Fashion. Four speakers, Orsola de Castro, Sophie Slater, Dian Jen Lin and Alex Jones gave short presentations on their experience of the fashion industry and why radical change is needed to make the industry forward-looking again. 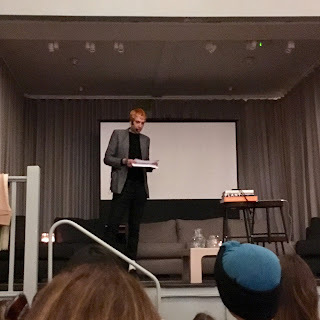 It would be all too easy to get disillusioned by dire environmental predictions or the seemingly insatiable appetite for fast fashion,so I was heartened to hear messages of hope from people who are determined that fashion can, and should, be better. First up was Orsola de Castro, one of the founders of Fashion Revolution and, in her words, “a recovering fashion designer”. She spoke about the event that spurred her into action: the Rana Plaza factory collapse in Bangladesh in 2013, in which over 1000 people (mostly women) lost their lives. Horrified that young women died to satiate our appetite for fast fashion, she also soon discovered that brands knew very little about the factories where they were producing their clothing. She encourages transparency, not as the definitive solution but as the first step. At the moment, most brands can’t answer “who made my clothes?” and that needs to change. 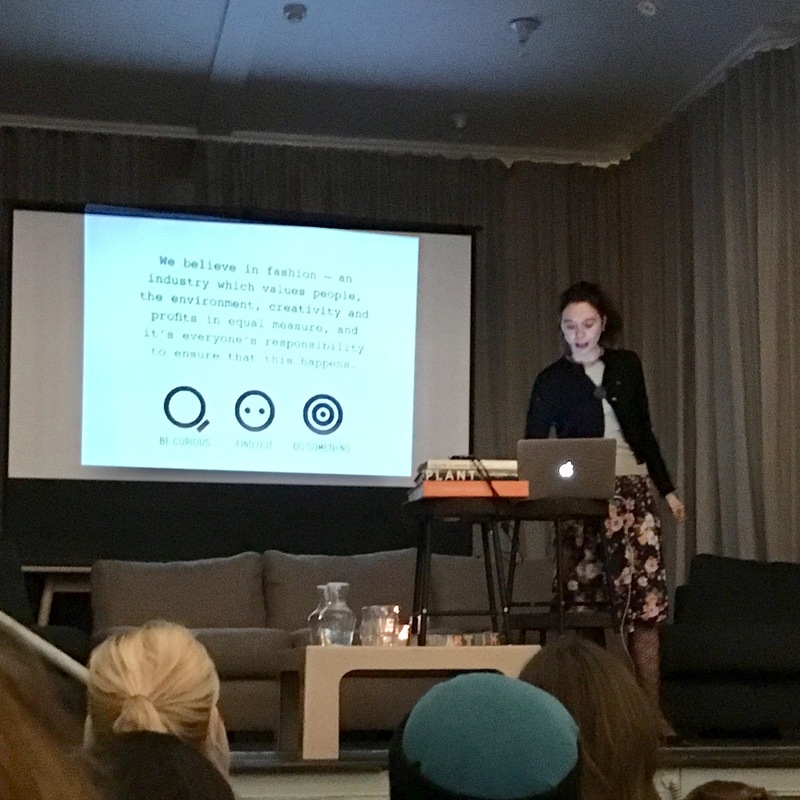 Fashion Revolution is an open source platform offering free educational materials, with a focus on transparency and social issues. Its aims are to educate consumers about the fashion industry, but also to change our minds about the way people currently view their clothes. We as consumers aren’t appreciating or loving our clothes, which means they get discarded more quickly. The focus of Fashion Revolution’s current campaign is the overproduction and disposability of clothes, which as Orsola emphasised, isn’t just confined to cheap fast fashion chains. Luxury brands throw away as many clothes as high street shops, suggesting that clothes that cost a lot of money to buy have little value to the manufacturers. As consumers, we have the power to change this culture, and a good starting point is to only buy what you love, and pay attention to what is in your wardrobe. Clothing isn’t just an issue for those in the fashion industry, it affects 100% of the population! To Orsola, “sustainable” and “ethical” aren’t helpful words, they suggest something niche when these practices should just be part of the culture. As someone who uses those words to define what I blog about, that’s really given me food for thought; am I limiting myself to “preaching to the choir”; could I reach a wider audience by using different language? Next to speak was Sophie Slater, the co-founder of Birdsong London. The brand’s motto is “No Sweatshop, No Photoshop” and they employ small groups of women with rare skills to make their clothes, from hand-knitters to seamstresses. Their mission is to empower women, from worker to wearer, and many of their makers are OAPs or migrant workers, who sign the tags on Birdsong garments so customers know who made their clothes. Their makers appear in advertising campaigns as well, which I thought was a great idea; it emphasises how central skilled artisans are to the production of beautiful, good quality clothes. As well as paying a living wage, Birdsong London supports women’s organisations, and they have a commitment to caring for the planet as well as people. They use reclaimed or organic fabrics wherever possible; 80% of Birdsong’s Spring/Summer 2018 collection from reclaimed fabrics; they have a partnership with Traid, to use clothes that don’t make it into Traid’s secondhand shops. I really like their emphasis on small production runs, giving their clothes an element of exclusivity and ensuring that their makers are employed but not overworked. 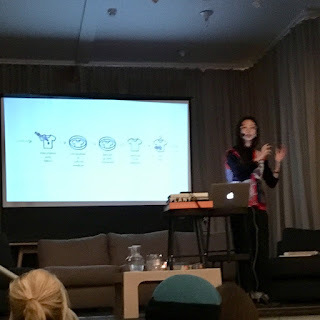 Dian-Jen Lin, an “interdisciplinary designer/ researcher” had a fascinating take on the current approach to sustainable fashion. To her, sustainability is passive, regenerative sustainability would be proactive, so what we need is Regenerative Sustainability Activism. This is going to involve a radical re-thinking of how we apply new technologies to garment manufacture. As well as developing fabrics that are recyclable, or use recycled materials, we could develop clothes that actively give back to the world around us. oxygen could be a great solution to air pollution. She works with The Sustainable Angle, who help to promote and develop innovative new fabrics. 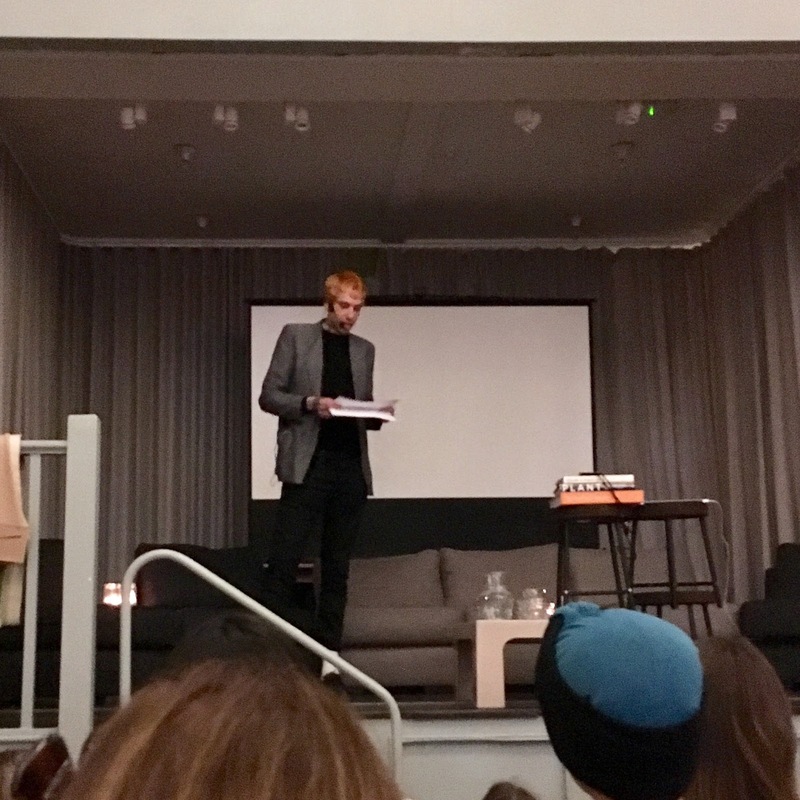 From leather alternatives made from post-consumer food waste, to sustainable sequins, you can read more about the Sustainable Angle’s latest event, the Future Fabrics Expo, in my recent blog post or on their website. Designer Alex Noble gave us his overview of the fashion industry and how it has lost its way. In his opinion, the negative aspects of fashion currently outweigh the good, and we all need to work to redress the balance. The good aspects, the parts which allow designers to unleash their creativity and allow consumers to express their identity were the building blocks of the industry, but are now being exploited by multinationals who are only interested in profit. Alex believes that we as creatives and consumers have the ability to change the industry, through working together in a more egalitarian way. 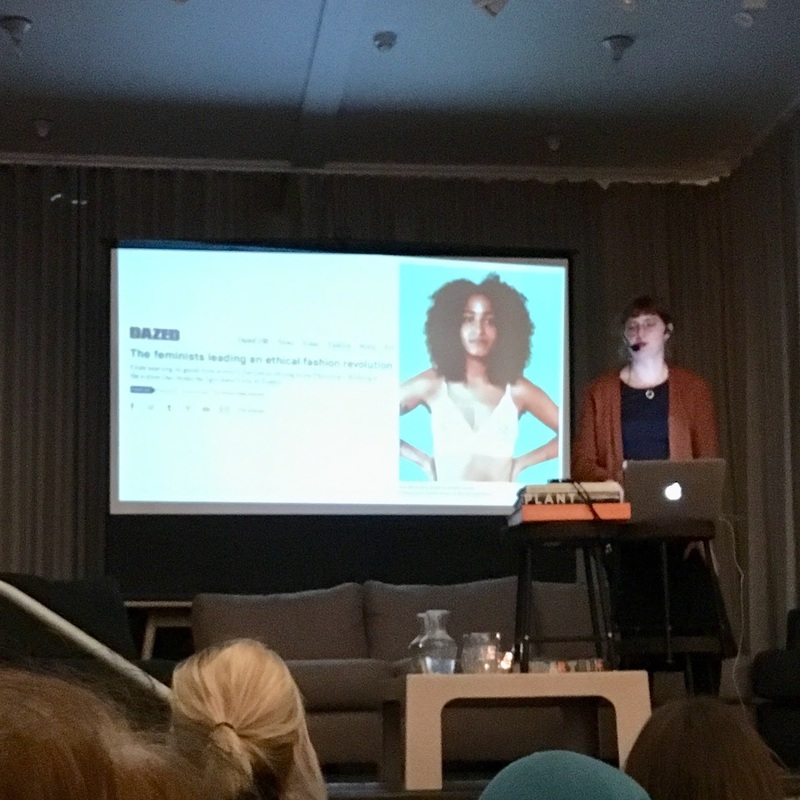 More communication and collaboration is vital, to encourage transparency and to make sure a more diverse fashion industry is able to flourish. He is in favour of a return to small-scale manufacture, emphasising that garment workers are people, not statistics, and that manufacturers should take into consideration the quality of life their products are creating. To embed these values in the industry, teachers and students at fashion colleges should be making sustainability a priority, not a project, and we as consumers have to embrace this change and support small businesses! I loved hearing such a variety of insight from people trying to change the fashion industry for the better in very different ways. The second part of the evening was a Q&A session, and I’ll be publishing a second blog post in a couple of weeks to share more from the panel, so stay tuned!